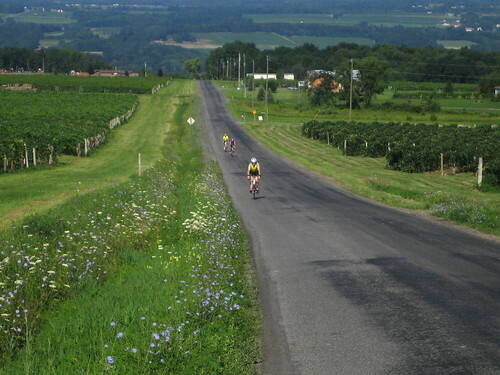 Great Finger Lakes Bicycle Tour? 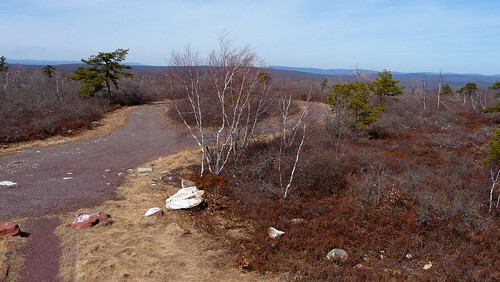 I am contemplating registering for the 2009 Great Finger Lakes Bicycle Tour. I don’t do a lot of organized rides, but this one looks great. A short ride Friday evening, and lots of options for Saturday and Sunday ranging from 21 to 91 miles, including some new mixed-terrain options. 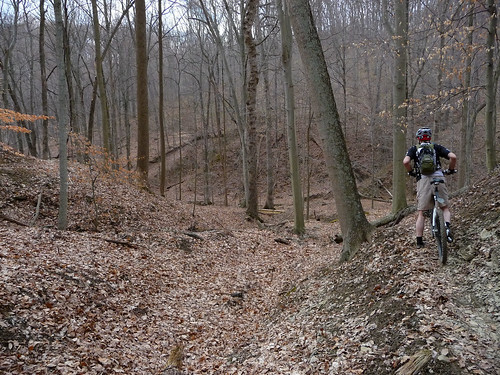 I think these use rail-trails, so the terrain should be relatively tame during those portions. The rest of the ride looks to be very hilly, but I have not found any routes or elevation profiles online. 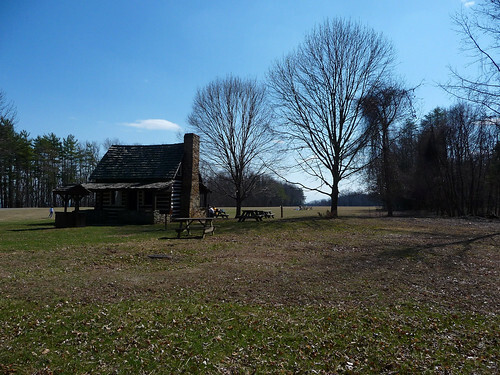 The ride also features several catered meals, and camping is provided. Home base is the very beautiful Watkins Glen State Park, which is home to an impressive 19 waterfalls. A far cry from a self-supported tour, but it sounds fantastic to me. Has anyone ridden this ride? Is anyone interested in riding it? Here are some photos I found from last year. 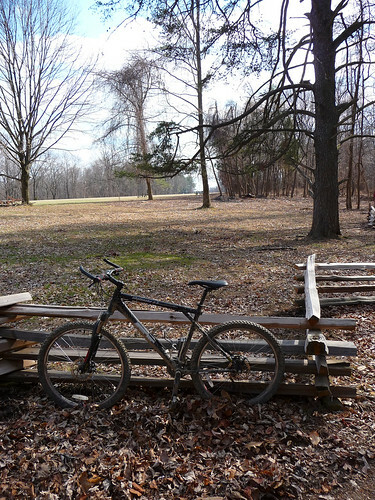 Posted in Bicycling, Road Biking, Touring | Comments Off on Great Finger Lakes Bicycle Tour? Last weekend, I decided to try a different kind of mixed-terrain ride. 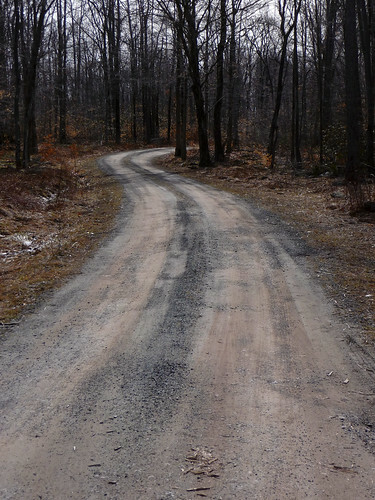 I threw the Long Haul Trucker on the back of the car and drove to Lackawanna State Forest. 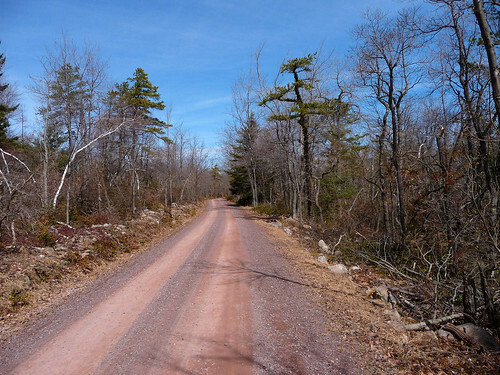 I hiked there back in November with The Blasphemous Bicycler, and we had commented at that time that although no bikes are allowed on the main trail, the gravel roads looked like they’d make for some great riding. I’m glad I finally got around to riding there. 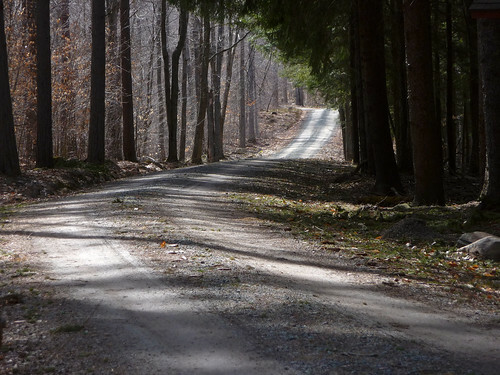 I planned a route using Google Maps and some other maps, taking what appeared to be gravel and paved roads through the state forest and the neighboring State Game Lands 135. Here’s a map of the route. 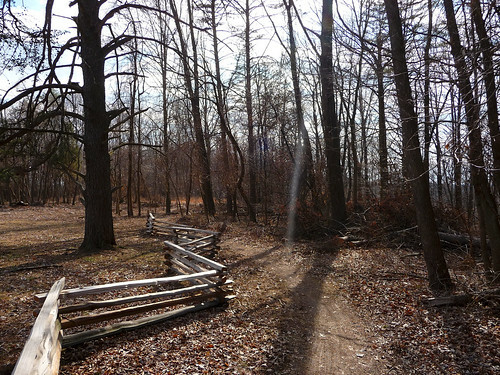 I started by parking at the main trailhead for the Pinchot Trail. 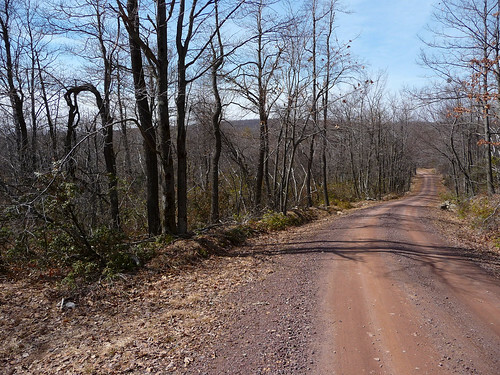 From here I rode on a paved road briefly until I reached Pittston Road, a beautiful, quiet gravel road through the forest. 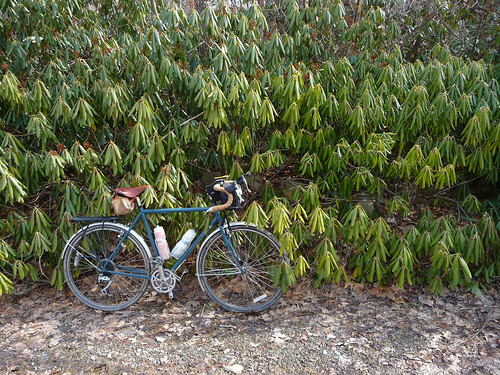 The vegetation was a bit sparse, and the terrain was rocky, but the gravel road was insanely smooth. It was very pleasant riding. 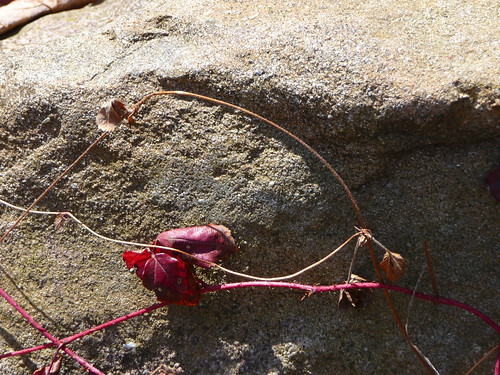 And although I knew I had some climbing to do, it was very gradual and easy. 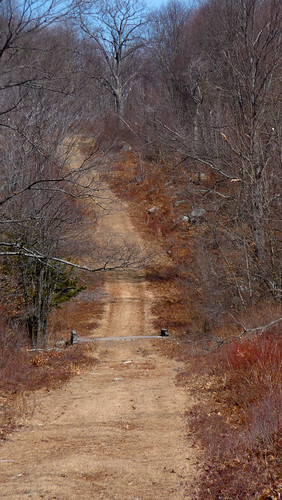 The gravel roads had gates — some were open, some closed. I rode right around the closed ones. I saw some other roads and a snowmobile trail and was tempted to explore them, but I left them for another trip and stuck to my route. 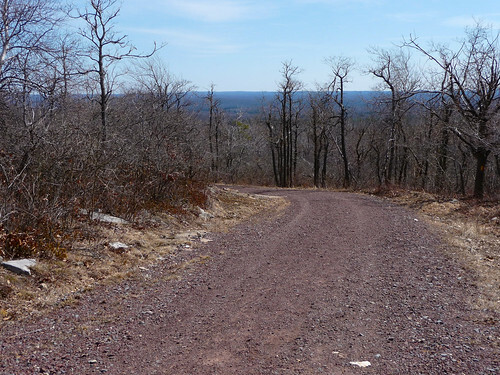 After some more gradual climbing and some rolling hills, I reached Pine Hill Road, the road to the overlook. 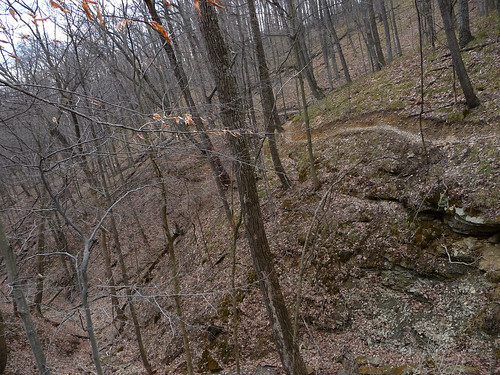 It was steeper, but still ridable. I’m really quite surprised at how easy the climbing was overall. I climbed over 250 feet but hardly even noticed until the steep section at the end. 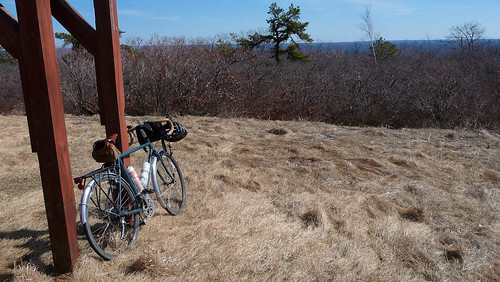 I reached the observation tower, parked my bike, and climbed the dilapidated steps to the top. 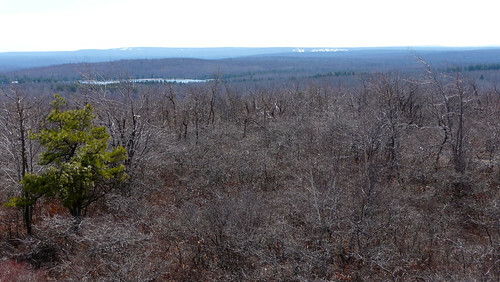 Some hikers were there, enjoying the view and resting. I talked to them for a few minutes, snapped a few photos, and went back to my bike to ride back down. The view (despite being panoramic) was pretty, but not spectacular. 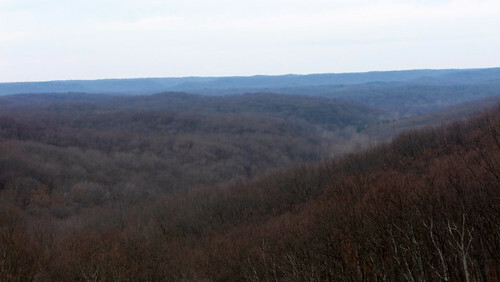 I was at one of the highest points in the area, at about 2270 feet. 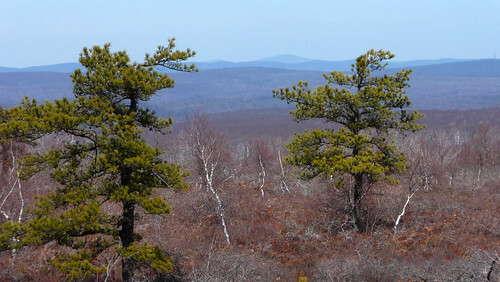 Very little was taller, and the relief at this higher elevation is less extreme. 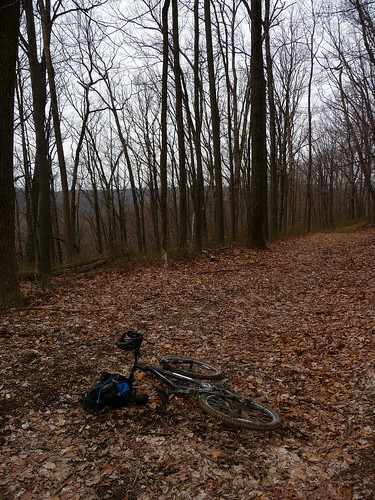 In effect, this higher-elevation area is flatter than where I normally ride. 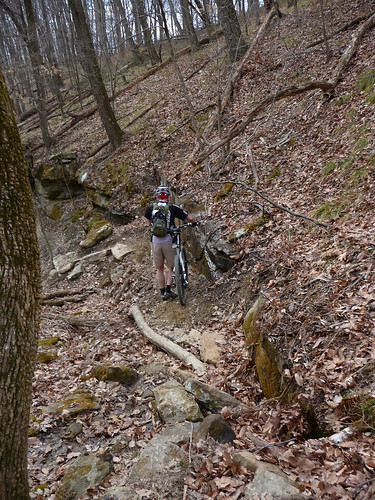 On the way down, I enjoyed the fruit of my labor in the form of a fun, fast descent. 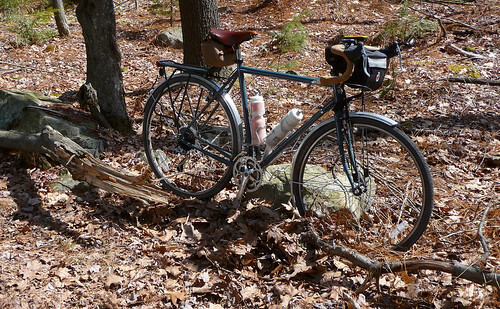 Traction was good once I got back to the smooth gravel road, and I enjoyed a few minutes of effortless riding. But that didn’t last long. 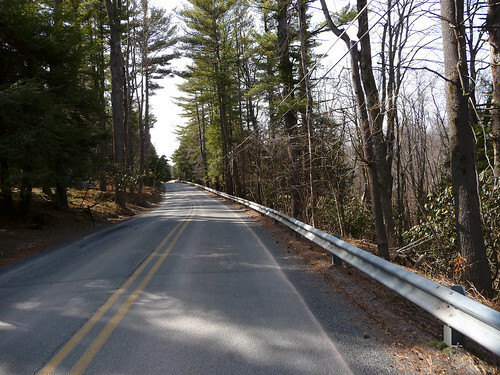 I turned onto Sassafras Hill Road, and began climbing again for a while. 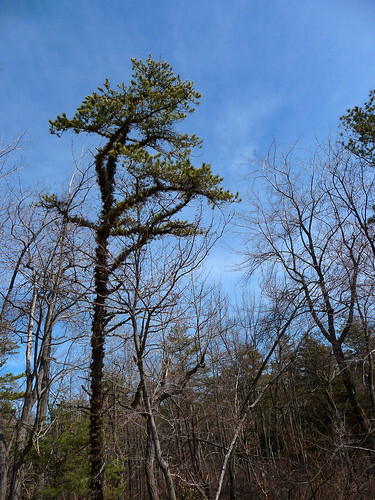 This climb was shorter than before, but just as pretty, and featured some more sparse vegetation. Occassional rhododendron thickets and stands of pines punctuated the otherwise-bleak landscape with some lovely shades of green. I began what I knew would be a long descent, and I was looking forward to it. However, what I didn’t know was that the road surface was about to degrade rapidly. 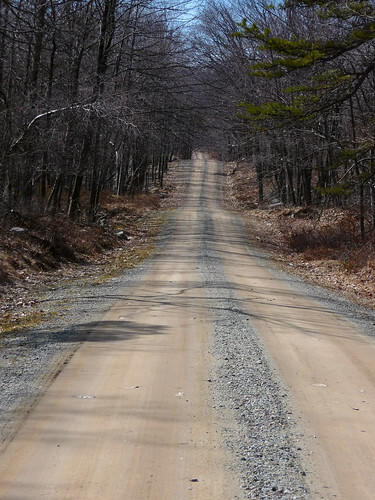 Suddenly, the road changed from smooth gravel to a very bumpy, rocky surface. I’m not sure why the transition was so abrupt. but it was. Suddenly instead of coasting along on a smooth road, I was doing bunny hops and trying to avoid rocks and even a few dropoffs. The Trucker handled all of it admirably, but I was a little worried. 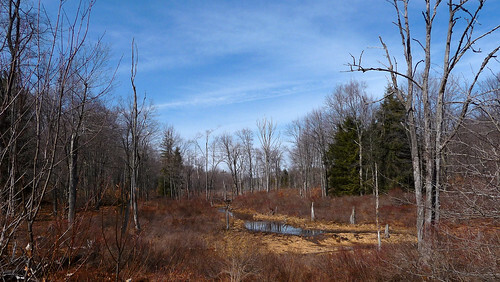 After about a mile of this, I reached State Game Lands 135. 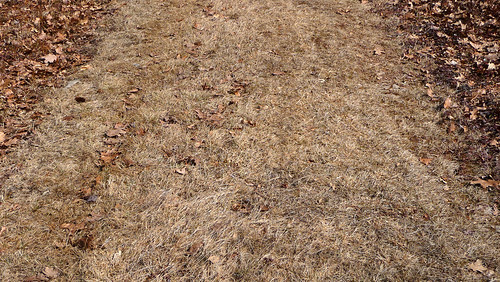 I found the road I was supposed to take and realized I’d discovered a whole new type of terrain: it was a grass road. 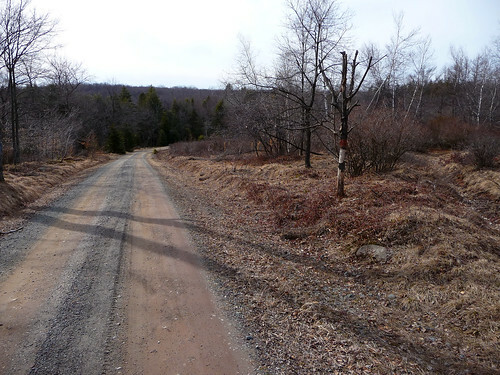 Now, I have ridden on many different types of terrain: paved roads, dirt roads, gravel roads, singletrack and doubletrack trails, fire roads, maintenance roads, logging roads, etc. But this is the first time I’ve ever encountered a grass road. There were some ups and downs, and really all of it was difficult riding. The grass slowed me down a lot, and some sections were muddy as well. I was constantly riding on different parts of the road, trying to avoid the mud. Otherwise, I’d sink in and get slowed down even more. 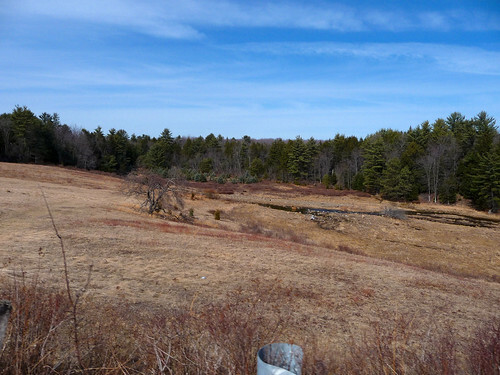 I came to a swampy clearing with a very nice view of a creek, and looked across the meadow just in time to see a couple of deer run by. 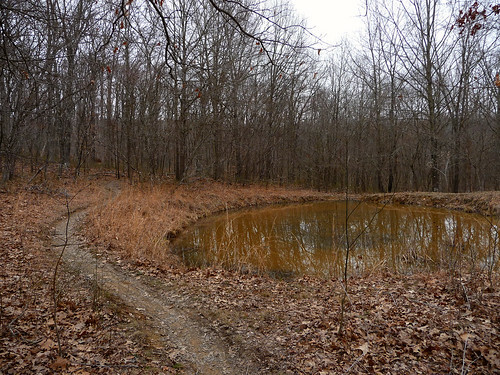 It was a very picturesque setting, although I couldn’t help but think about the fact that this land is set aside primarily for the purpose of hunting. Nonetheless, the theme of the day was quiet. I had only seen a few people throughout this whole ride, the rest of the time had been quiet solitude. Just as I had hoped. Despite the fact that I had another long stretch of downhill riding, it was quite tiring. I was pedaling hard just to keep moving. The grass was a real hindrance. I can’t imagine what it must be like in the summer. I passed another grass road that could be interesting to explore in the future. 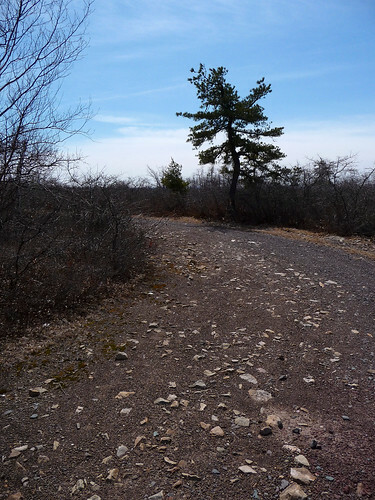 Eventually, I reached another rough gravel road, and soon after that, pavement. 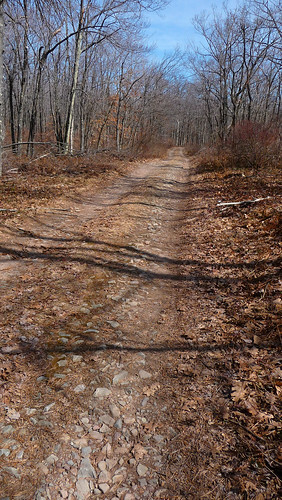 Riding on the paved road after all that gravel and grass felt smooth and effortless. 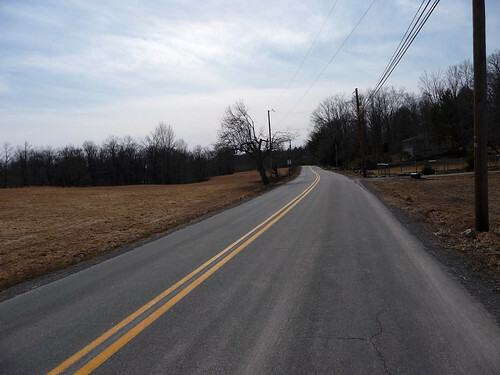 I even got to ride a couple more mostly-downhill miles, so I got to enjoy the smooth road. It was pretty, and traffic was very light. 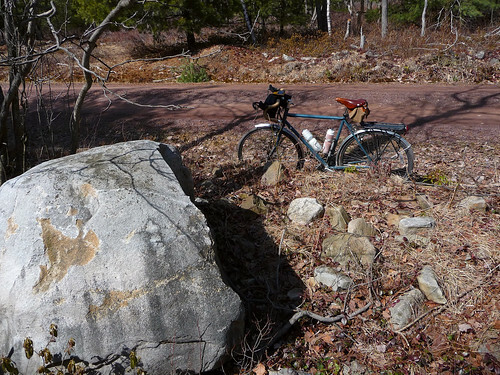 Toward the end of the paved roads, I did a little climbing, but it wasn’t bad. 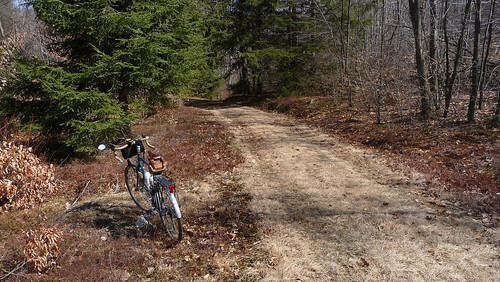 Next I turned onto the gravel Tannery Road, which turned out to be more uber-smooth gravel, and a lovely ride. 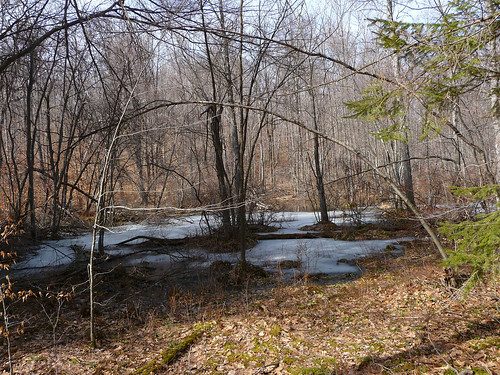 A few spots still had snow and ice in the woods. 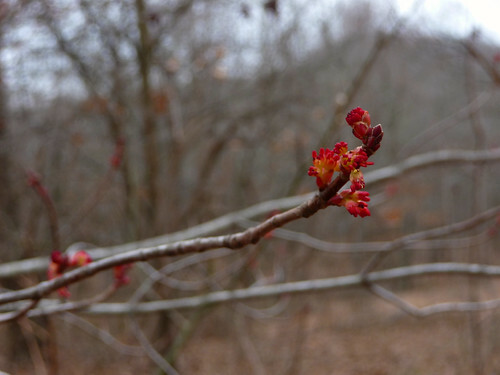 Spring sure is taking its time getting here. 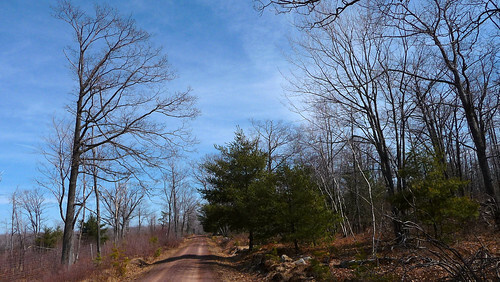 I was mostly climbing the whole time I was on Tannery Road, but once again, it was a very pleasant gradual climb. After some very lovely riding, I reached the paved road again and headed back to the car. I only rode a bit over 17 miles, but I was out riding for nearly three hours. 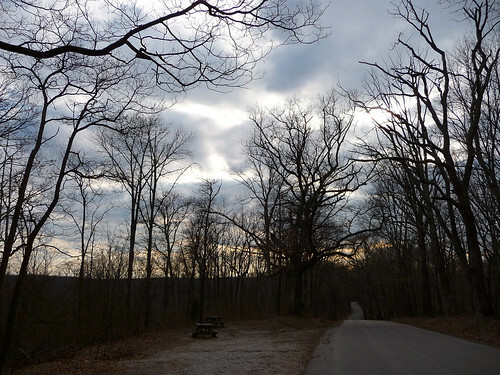 Of course, I stopped at the overlook, and I stopped frequently for photos. 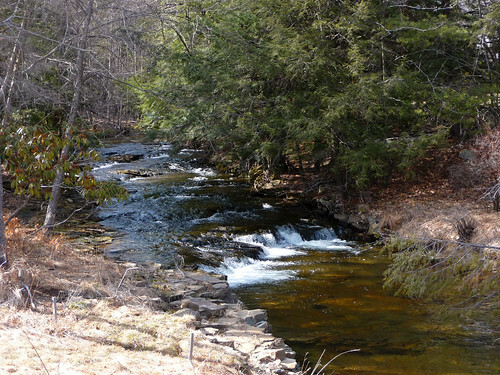 This ride had a great combination of leisurely and challenging riding, and there is plenty more to explore in this area. 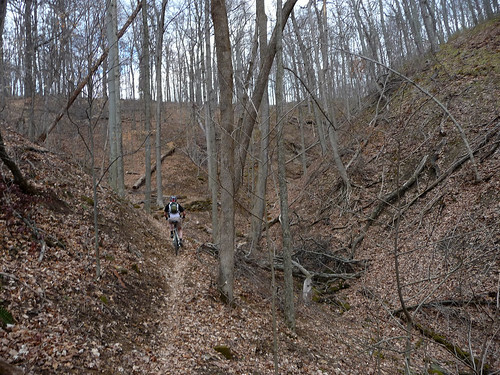 Here are a couple of other mountain bike rides I did with Dave at Brown County State Park while in Indiana. We rode the old trails. 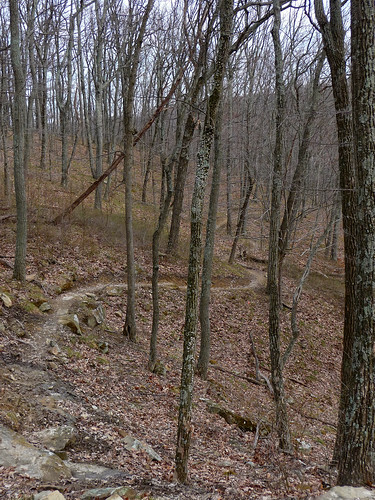 The first thing I noticed when we started riding was just how smooooooooth these trails are. 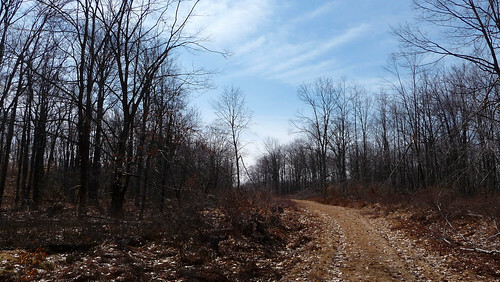 I knew it before, but compared to the trails here in Pennsylvania, the Indiana trails felt even smoother. I was hoping the hills would be easy after riding in the mountains, but that proved not to be the case. The North Tower Loop was fun, as always. The Aynes climb was harder than I thought it would be, but I guess it’s early in the season. I don’t feel bad about being sluggish. 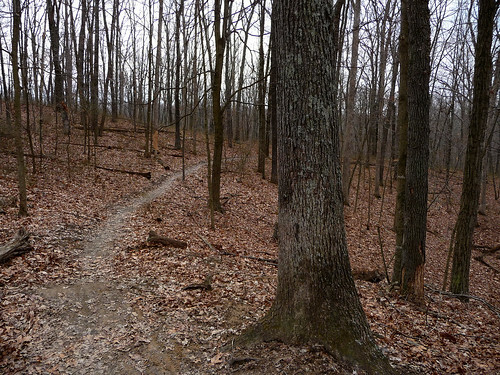 All the trails were in excellent condition, with only a few muddy spots and downed trees. The Hesitation Point trail just keeps getting better. The climb was not as grueling as I feared it would be, and they keep honing the technical features. 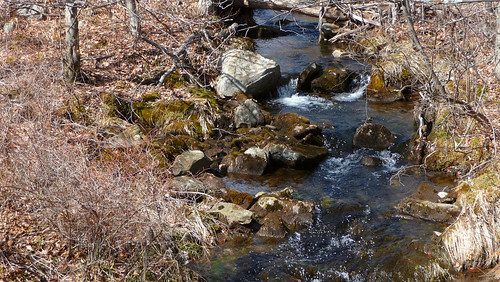 It’s far more ridable than it used to be, and this restores some of the great flow to the trail. I love it. It was a great day to be out on the bike. The next day, we had planned what we thought would be a shorter ride. I woke up feeling crummy in the morning and we put off our ride until later. 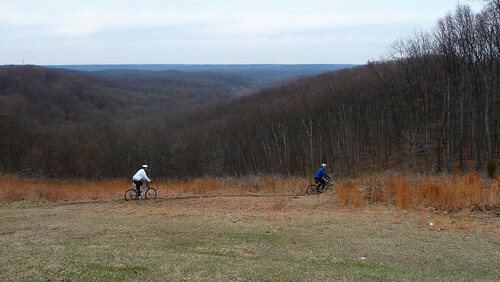 I felt well enough later in the day to ride, so we headed back to Brown County. 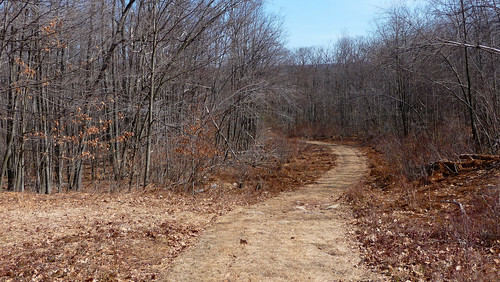 We were riding the new trails, which I have only ridden a few times. I always think I prefer the older trails, but I had a blast on the new ones — they’re growing on me. 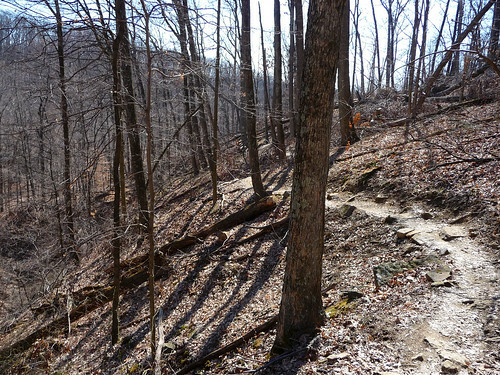 We started on the intermediate trail, which has a few technical parts. We had to walk a few times, but we were able to ride most of it. 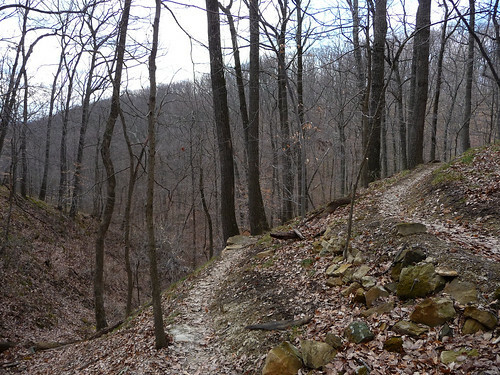 The Walnut Trail is fairly short and soon we were on the Limekiln Trail. 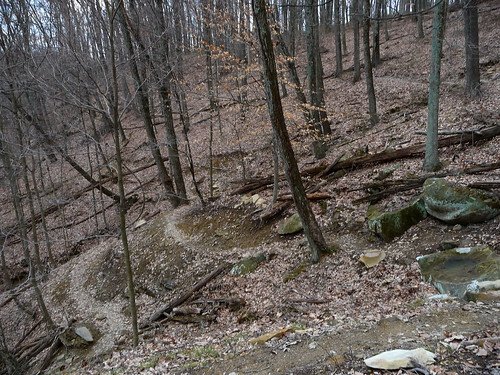 This is a “beginner” trail, but it is an absolute roller coaster ride for stronger riders. 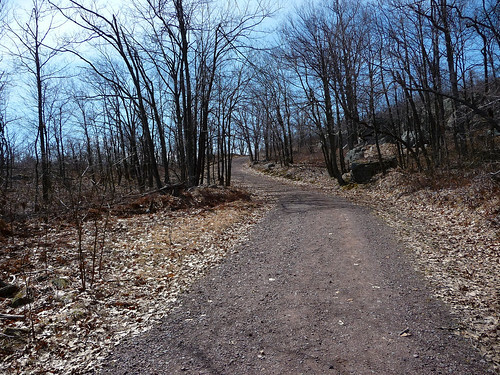 There are plenty of opportunities to catch some air, and the trail is smooth and non-technical, so you can really fly. We saw a couple of families out riding, and the kids were all doing an awesome job. We had reached the end of the trail system, so we turned around. The Limekiln Trail was just as much fun on the way back. 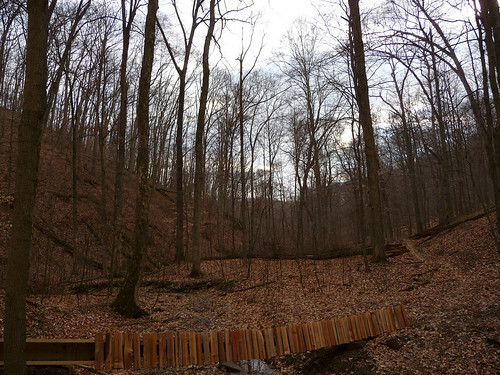 Once we returned to the Walnut Trail, though, we decided to check out the new Schooner Trace expert trail. 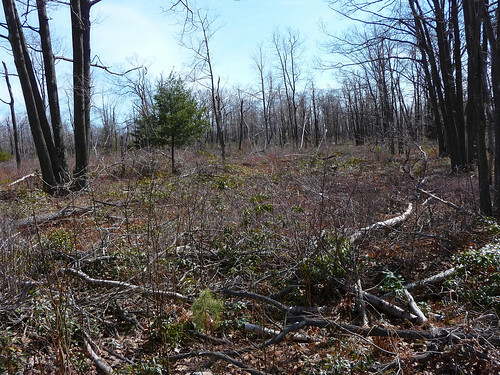 This trail is not yet finished or officially opened, but Dave knew where to find the trail. 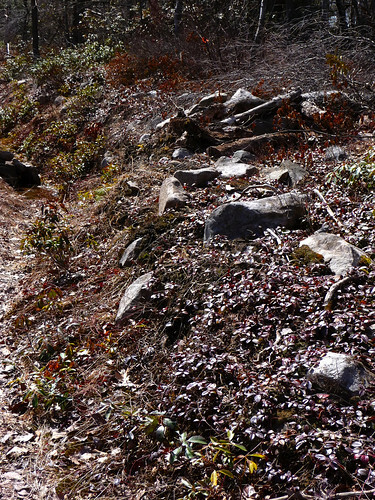 We had heard wild stories about this trail, and expected to have to walk a large portion of it. But we really wanted to check it out. I have to say, the trail lived up to our expectations in terms of difficulty, but parts of it were more ridable than I had anticipated — which also means it was more fun than I anticipated. However, it was indeed very difficult. 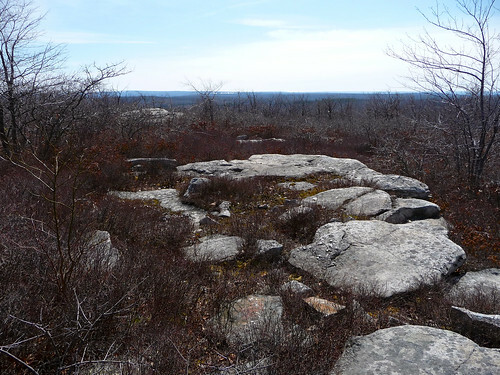 It’s an extremely narrow trail that often follows the edge of a cliff, with soem tight switchbacks and frequent technical features — mostly, various rock gardens and other rock work. 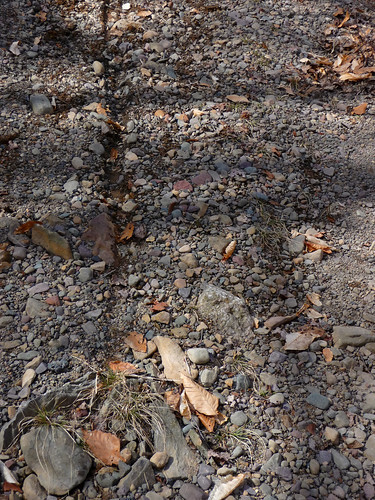 The trail is so narrow that there’s no room for error. 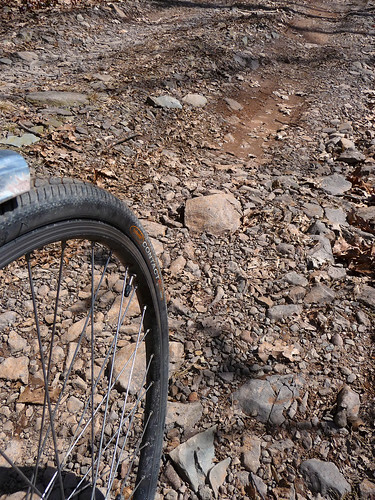 One time, I was off from the center of the trail by about two inches and my wheel started sliding down the hill. Yikes! 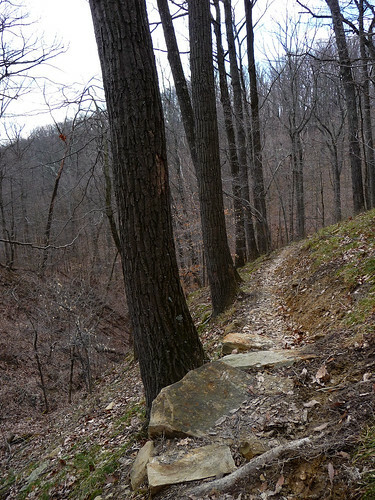 The trail skirted the edge of a gorge for a while, and we worked our way down. There was no blistering descent, the trail just went through a lot of ups and downs and we eventually reached the bottom. I was glad, because it’d be far too easy to go off the trail if you picked up too much speed (and it’d be impossible to climb in the other direction). We had a lot of climbing to do to get back out of the valley, but it didn’t seem too bad, considering. It was a gradual climb, for the most part. It was another fantastic ride. I was really glad we checked out the Schooner Trace trail, as it was a lot more enjoyable than I had expected, and it’s a real work of art. It covers some extremely beautiful land, and I can’t wait to ride it again once it’s completed. I was also able to ride some tricky parts I wasn’t sure I’d make, and that’s always a good feeling.